... you pull in the driveway and see your kid's tricycle and consider painting it. We found Christian's tricycle in the trash by the side of the road a couple of years ago (yes, I pick from the trash) and it's missing that cool thing in the back where we could have pushed him so it didn't get much use until he learned to pedal it on his own. The colors are totally faded but the fact remains that it works and he loves it. It's now parked in the front of the driveway (which is in front of our house) because he uses it so much and I have to be honest, it's irking me. Not driving me crazy by any means, but every time I pull into the driveway and wonder if I should just spray paint the thing black or something, anything to get rid of the faded plastic and blue that just stands out like a sore thumb to me. As much as I would love to say we could put it away in the shed every night, I know we won't. Life just isn't like that for us right now. I know this is one of those things to let go, but it has my OCD-design head twitching. We also have a toddler plastic slide/ gym thingy in our back yard... it too makes me a little nutty and I can't wait to replace it. We try to limit the toys coming into our house... When new stuff comes in, something else leaves. There just isn't room and we don't want our kids to have a million toys they never use. If something's not getting played with enough, we put it away and take it out a few months later. I know I sound like a freak. What are your thoughts? (Not on my freakishness, on toys ;) And, any tips for spray painting a plastic bike? Maybe just the blue parts??? Before we moved, I actually had a winter tub, spring tub, summer and fall tubs that I divvied all the toys up. I actually discovered that we didn't have that many so my gazillion of children's books went into the tubs. Since moving the toys have seemed to accumulate. I am about to get more tubs and do some toys that way. She has so much stuff that she never plays with. We are fortunate to have a nice sized playroom, but it gets overwhelming and she doesn't even go in there. I just have to do it when she is gone or she gets upset!!! You are not a freak! I"m the same way! I try to get them "retro" toys or classic wood ones.... they just look better. Plus they last longer! My boys seem to like the more simple toys anyway than the ones that blink and make noise. I think it makes them more creative. As far as spray paint - I spray painted some plastic woven bins once.... the can said the paint was for plastic, but the boys are so hard on things it literally chipped and rubbed off within an hour. Didn't work for me. I totally understand. I don't even have kids, but my neighbors do, and they have toys all over their yard. If it were me, I just know I'd want to paint it to spruce it up. :) Bonus points for rescuing it from the trash!! Now I do think that the metal red/white ones would be easier to refinish, so to speak, but your plastic one was free, so why not give it a try? Haha, I get it girlfriend. The exersaucer my son loves right now is the WORST. So ugly, but whatever gives me 5 minutes of peace is fine with me :) Any suggestions on great places to buy wooden toys? Love the cute trucks! I think you're preaching to the choir, here :)! I, too, did not like the plastic toys my children had, and tried to keep many of their toys "vintage", but definitely considered painting the plastic crap! They both loved their "flintstones" car (you know what I'm talking about, right? ), but I hated that yellow roof. If I had had the chance, I would've painted it! Just an fyi but you can get those things to push the car that is missing from the maker. Usually they sell all kinds of extra parts and stickers. I know little tykes does and the stick push thing we needed for our hand me down car was $8 plus shipping. Cheap considering the car was free!! So funny...I can relate! When I was pregnant I remember saying we wouldn't have any plastic toys... they found the way here. We got the cool vintage style tryke for our daughter and it was so heavy she really never used it. Good luck! You are too funny! I say wait until he grows out of it and then get one you like. That's the great thing about kids' stuff...they grow out of it all eventually. I have a red plastic firetruck outside of our house that my son loves and it drives me crazy. But it makes him so happy, I can't bare to part with it. I don't think it would paint well. This made me laugh. But I'm right there with you. Love wooden blocks and trucks for little boys. And we'll be on the same page as you one day soon--- when something comes in... something needs to go out! Paint it! I've seen blog posts where plastic houses (you know, those huge ones that are actually kid-sized) were painted, so I feel like a tricycle is paintable too. Just find a spray paint that is intended for plastic and go to town!! Oh I am RIGHT there with you Lauren! The kids plastic stuff gets so icky and faded. We got the same metal tricycle but with a wagon attachment. My awesome father in law even repainted and repaired the old thing and it looks as good as new. Too funny! My husband would say "Let's go buy another hunk of plastic" whenever we were thinking of getting another kid toy...and we had lots: the Flintsone car like the other reader above, the green turtle sand box, the kitchen appliances and tea sets galore. If you can paint...go for it! I completely understand. I have been where you are but now my kids have out grown the "plasic." You're soooo not a freak! It's actually refreshing, to see a mom who doesn't just presume their whole world must be consumed by their childrens' items. My husband and I both detest all the new, plastic things, but unfortunately have had to give in on a few of them. I go to playdates with my girls, and other kids have SO MANY toys - entire playrooms full, and I wonder if maybe we're the weird ones. In my heart, though, I know we're doing right by our children to NOT give them everything they see, and teach them to use their imaginations! Oh...and I say try the Krylon spray that's made for plastic for his little trike! I'm soo with you. I am seriously considering painting the kids plastic play house to match our house, LOL. Oh the baby toys just drive me crazy. I actually considered recovering my daughters play gym & her bouncy seat. Ha! By the time I got that done, she would've outgrown them. But they are just so unattractive! I'm with you on the toys. Last year I totally got rid of most of the "junk" plastic in our home and kept the good blocks, puzzles, games, cars, and trains. As far as bikes and such, we have the same faded problem and I've already been looking for replacements. I was just like you with my first two boys, now 20 and 18 (TODAY!). I love nostalgic toys but for some reason they favored battery operated things. I saved the good wooden blocks and wooden train set. I also saved a bin of assorted Play Mobile figures and Star Wars things (ugh)! Well, I suddenly found myself pregnant again at 42. My third baby boy is in Kindergarten this year and guess which of his inherited toys he prefers to play with. That's right, the plastic stuff. Do I care? Absolutely not. As an "elder mother" you realize their childhood doesn't need to be your idea of the perfect childhood. I know you've heard this but - it goes so fast. I also know from your blog that you celebrate and relish every day with your boys and husband. That is awesome. They will be 18 before you know it! You are definitely not alone!! I say go for spray paint...they make a special one for plastic. Krylon, I think. Don't get the metal bike--it will rust sitting outside all the time! I go through our toys pretty regularly (but while the 4 year old is at preschool b/c he freaks and won't let me organize/get rid of anything). Once it's been put away or donated, they don't even notice it's missing! Go for it Lauren, spray it with Krylon. I used it to paint my dark green plastic adirondack chairs white and the paint has lasted for quite some time now! Somewhere on blog land here I read about someone painting the plastic car black and making "headlights" etc. for the car. They even posted pictures and how to. You should totally do it. I have had really good luck spray painting plastic- just use the plastic spray paint but also they make plastic primer. I have used those together with really good results with outdoor stuff. Try it! I think about repainting/redoing everything I see! I can hardly live with myself sometimes...I'm past the toys stage, but trust me, after that, there's the teenage things! The old classic Fisher Price things I saved are the favorite of my visiting 4yr old grandson. But just wait: one word for you... Legos. And you can never have too many. Just cleared a path to the bed for the twins. L - I so relate!! Are you coming to High Point Market? I will totally give you one of my twins' red Sky King tricycles. Crazy expensive, I insisted we have it so that I wouldn't have to look at something ugly ... and it just does not fit them for some reason! When my youngest was a toddler he wanted a kitchen so bad. Only at the time all the plastic kitches were cute and pink. So I picked up one at a thrift shop and sprayed it black. It worked just find and lasted a long time. I say go for it! Oh it felt nice to read this. One of my biggest fears about having kids is that their toys wont match the house, and when things don't match the house, I tend to dwell on them until they do. I think in your case I'd get a new one that you like (and that he likes, too, which i know is obvious) rather than spray paint. Lauren, If you are going to spray paint the bike black why not recover the seat in a stylish houndstooth check and add some tassels to the handlebars? Just joking and I know how you feel about toys but very quickly those toys will not be around and they will be replaced with ear phones in a surly teenager's ears and you will long for that beat up bike. I say, relax and enjoy. Couldn't agree more! Lauren, where did you get yours son's trucks and cars? I have a feeling my little guy will love those when he is a bit older! Thank you! I am a big fan of classic toys, unfortunately my children go crazy for the small plastic yucky ones...I have sometimes thought to myself "what if I painted all of my daugher's Petshops (be happy you only have cars and trucks) one color?? White maybe" they would look cohesive, maybe even nice. A girl can dream can't she??? --Gretchen O. 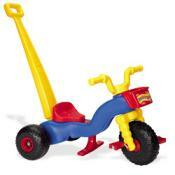 Ok...I think Fisher Price just made it easier for you....they just recalled millions of those trikes! Now get a good ole fashioned one! I can relate...being very visualy minded overlaps into EVERY category of life!Including kids toys! I also was of the less is more philosophy...and said I would die before I bought any of that plastic crap...like those big plastic houses and all...dramatic...perhaps. But consequentlly My kids played outside alot. Built their own forts inside and out. Made their own stuff. Usually as they were wearing capes and mudpuddle boots. We always had a big suitcase of dress-up clothes...that fueled their imagination. Wooden blocks were some that I have kept through the years...and playmobile people...and little britians. But the all time fave was the HUGE dirt pile(thanks to our neighbors that brought it over with their tractor) and their John deer tractors and digger loaders...Man that lasted for YEARS! I am an interior designer and mother of two boys. I took pictures of my playroom/classroom today for you because I am an OCD mother and designer! I have the boys constantly go through their toys and then they pack them up and we venture to the Rescue Mission and they donate them to other children. I paneled the walls and made the bi-fold doors to match the paneling. I put the display ledge around the room to handle the trophies and art that begin to accumulate. The boys love to decorate the ledges with their "stuff!" Also, I have the baskets tagged and when they learned to read, clean up became a snap! They keep their toys pretty well organized. Also, leather ottomans are on casters and comfy for me, but extremely durable for them! I put the boys in the same bedroom when my youngest was 2 and ready for a big bed. They are 19 months apart and I keep the sleeping bedroom clear of toys and everything else is in the classroom/playroom! Best of luck and enjoy life and learning with your darling little ones! Why has no one designed toys for a designer in mind? I agree with you - Do you have a rope swing? Horse shoes, bean bag toss, tinker toys? I too limited too many plastic toys....I love classic items - wooden and good quality over quantity. Lauren - My son is now 13 and I wish that all I had ever bought him was classic toys. They really only play with the classics - Legos, Playmobils, wooden castles, wooden blocks, cars and trucks, marble mazes, balls, bikes, scooters and the big outdoor stuff. I've had tons of kids in my house over the years and this is the stuff they always ended up playing with no matter how old. Stay strong, limit the stuff. Teach your son that life is about experiences and not stuff. He'll thank you someday. I can so relate to this and my son is only almost 7 months old. He doesn't have that many toys, but they are all bright primary colors. I can only imagine the scene as he grows and gets those outdoor toys. Thanks fo asking this question! 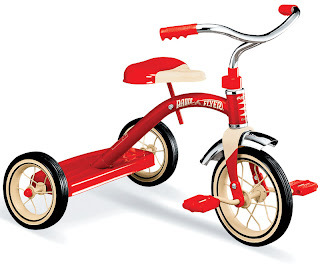 I've been trying to figure out how to spruce up my little girl's trike. Oh, and just wait till they're a little bigger - I'm trying to figure out how to incorporate the thousands of LEGOs in my living room - some sort of modern art installation? I totally have the same mindset. One of my worries when I was pregnant was how crappy our home was going to look with all the bright plastic kid stuff strewn about. We don't have a big home so a room dedicated to just toys is not an option for us. My daughter is still a baby (4 months tomorrow!) but I'm already drawn to the retro looking toys. I figure if I have to look at it too, it may as well be easy on the eye. I have the "Flintstones" blue police car in front of my house. Puts a smile on my face. He's my third and only young once. Children have way too much stuff these days. I love to have a lot of a few things. We have a large antique box in the kitchen filled with classic wooden building blocks. I also love playmobile 123.